© Skaidrīte Gūtmane, 2015. Study programme accredited on June 5, 2013, within the Study direction “Arts” for maximum duration of 6 years. In 2018 the term of accreditation has been prolonged until December 31, 2022 (with the Paragraphs No. 48 & 49 of Transitional Provisions of Amendments of Law on Higher Education Institutions from 21.06.2018.). The study programme is focused on penetrating research of both Eastern and Western Church art traditions and canon. This is the only study programme in Europe offering such knowledge in Icon painting, Classical painting and Graphic art related to the Church. Icon painters are required in European countries and we are proud for our graduates working on commission in Russia, Bulgaria, Greece, Romania, Israel and, of course, in Latvia. Essential role in the making of the programme was long-term participation of the Academy in archeological digs in Israel. Study programme director: prof. Ieva Sergejeva. Teaching available in languages: LV, ENG, RU. © Skaidrīte Gūtmane, 2015. This is the only study programme in Europe serving as methodological foundation for analysis of social processes, thus strengthening social policy platform in Eiropean countries. 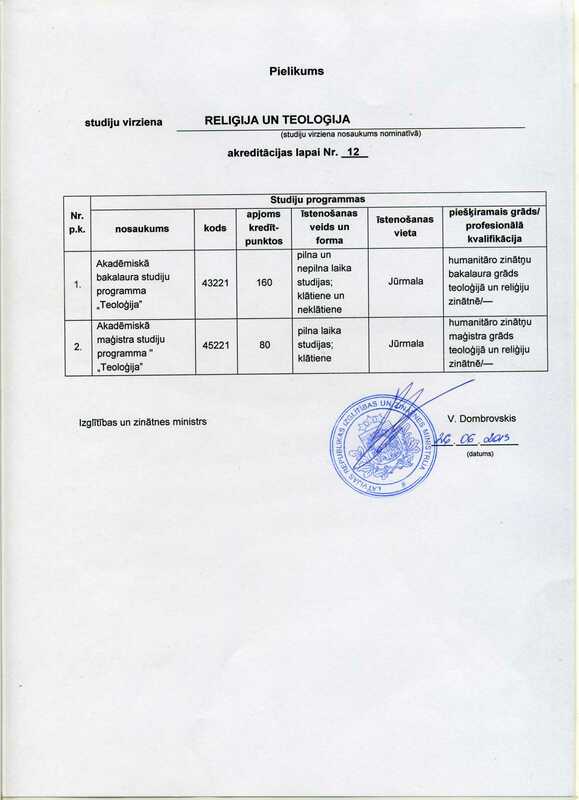 Study programme accredited on May 22, 2013, within the Study direction “Religion and Theology” (Accreditation list No. 12_1, Accreditation list No. 12_2) for maximum duration of 6 years. In 2018 the term of accreditation has been prolonged until December 31, 2022 (with the Paragraphs No. 48 & 49 of Transitional Provisions of Amendments of Law on Higher Education Institutions from 21.06.2018.). The goal of the study programme is to implement the Bologna process in higher education. Bachelor graduates from both social sciences and humanities interested in interdisciplinary studies are accepted: how to apply knowledge in theology as a strategic tool for scientific analysis, expertise and strengthening of human resources in Europe by use of interdisciplinary research and using method of integrative theology and / or other methods in independent scientific research in penetrating analysis of various fields of the Social teaching of the Church, Eco-theology, Church history, Christian anthropology etc. 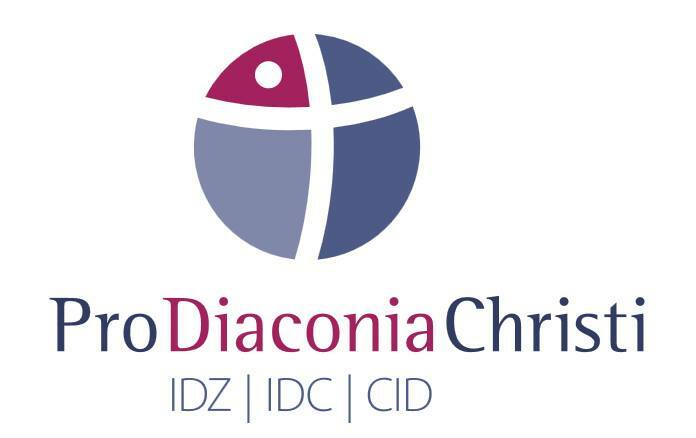 Students have an opportunity to deepen their knowledge in the Orthodox theology and theological foundations of the Church art. Study duration: 2 years. Volume: 80 credit points/ 120 ECTS credits. Study form: full-time. 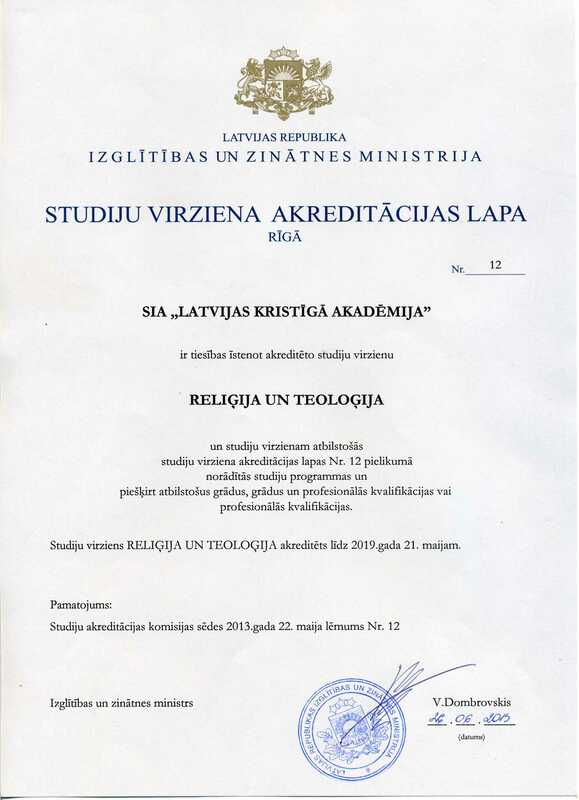 Qualification awarded: academic master of theology and religion science. E-learning available. Teaching available in languages: LV, ENG, RU. Programme licensed in February 27, 2015 within the study branch “Social welfare”. In 2018 the term of accreditation has been prolonged until December 31, 2021 (with the Paragraphs No. 48 & 49 of Transitional Provisions of Amendments of Law on Higher Education Institutions from 21.06.2018.). The programme is meant for specialists in social welfare field willing to master professional qualification in supervision for social workers. Goals of the programme 1) to offer qualified education in social worker’s supervision; 2) to master various forms of supervision; 3) to implement innovative approaches in supervision (e.g. caritative supervision etc.). Applicants must have bachelor degree or the 2nd level professional higher education in social welfare (social work, caritative social work, social pedagogy), social sciences, human behaviour sciences, health care, pedagogue or educational sciences, humanities. Degree and qualification – professional master degree in social work and professional qualification „Supervisor”. Experienced supervisors are involved in teaching both from Latvia and abroad. Good fieldworks guaranteed. Opportunity to join studies and fieldworks within the ERASMUS + programme abroad. The study programme follows unified competence standards accepted in Europe. Director of the study programme: assistant prof., mag. theol., supervisor Dace Dolace. Acquisition of modern models in theory and practice in the field (21 CP). Research work in supervision (4 CP). Innovative knowledge in supervision (anthropology) (4 CP). Entrepreneurship and management module (5 CP). Supervision fieldworks I, II, III (26 CP). State exam – working-out and defence on Master Thesis (20 CP). © Skaidrīte Gūtmane, 2015. The study programme is evaluated as having innovative methodology – promoting phenomena of charity into Social work education. The programme was discussed with Pope Francis in His Apostolic palace (Vatican, Rome) in June 4, 2016. It is one of a kind in Europe. Study programme accredited on July 3, 2013, within the Study direction “Social Welfare” for maximum duration of 6 years. In 2018 the term of accreditation has been prolonged until December 31, 2021 (with the Paragraphs No. 48 & 49 of Transitional Provisions of Amendments of Law on Higher Education Institutions from 21.06.2018.). The programme is focused on penetrating acquisition of forms and methods of caritative social work in times of change; special emphasis is put on the principles of social economy in the context of social work. These skills lay good foundation for further private entrepreneurship in the field. The knowledge is both required and innovative in European context. 2 years (full-time) and 2,5 years (part-time) – volume: 80 credit points/ 120 ECTS credits: for students without bachelor in caritative social work. Study forms: full-time (in the evening) or part-time (1 week p/month). E-learning available. Requirements: higher academic and 2nd level professional higher education in caritative social work, social work, social pedagogy; bachelor degree in psychology, health care, education / psychology, personnel management, theology; 2nd level higher professional (or equal) education in pedagogy. Degree awarded: professional master degree in caritative social work. Qualification awarded: 5th level professional qualification “caritative social worker”. Study programme director: assoc.prof., Dr. theol. Astra Dannenfelte. © Skaidrīte Gūtmane, 2015. This is the only study programme in the Baltic States offered rights to implement prestigious Jean Monnet Study Module. Latvian Christian Academy has received an awarding ERASMUS+ “Jean Monnet Module” plaque from EC EACEA (Education, Audiovisual and Culture Executive Agency) in May, 2017. As the following letter states, “The purpose of this plaque is twofold. 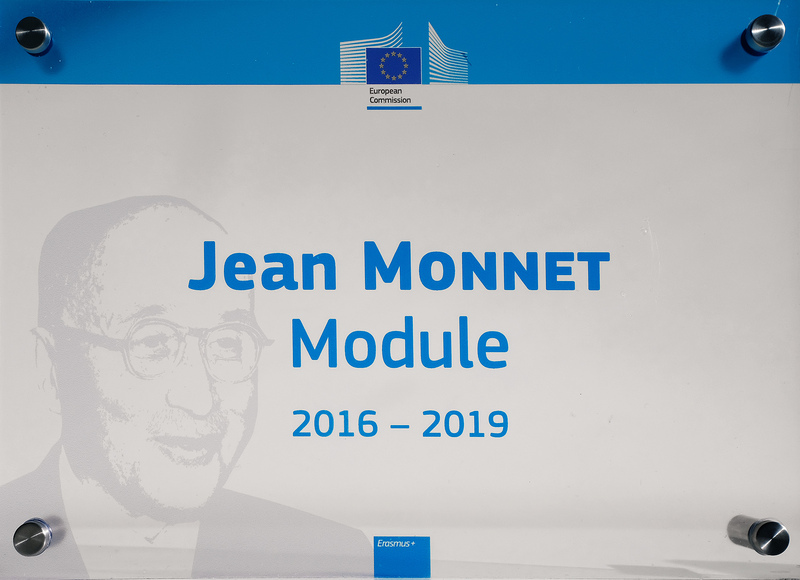 It serves primarily as a label signifying quality in European integration studies and represents the achievements of your Jean Monnet Module in this field. At the same time it also provides visibility for the Jean Monnet Action, presenting it as focal point within and outside your institution for the promotion of European issues.” The Module title at Latvian Christian Academy is “European Social Entrepreneurship with the Future”. Study programme in Social Entrepreneurship Administration is the only study programme in Latvia based on the innovative concept of Social Economy promoted in EU countries. The programme links principles and methods of social work and social entrepreneurship in interdisciplinary package with aim to reach social goals in entrepreneurship. It offers insight in both the principles of organization and the running of social business, deals with social and spiritual needs of socially marginalized people, promoting the cohesion of society. Academy welcomes new students at an innovative programme! 2 years (full-time) and 2,5 years (part-time) – volume: 80 credit points/ 120 ECTS credits: for students without preliminary knowledge. Study forms: full time (in the evening) and part time (1 week p/month). E-learning available. Requirements for enrollment: professional bachelor in commerce or economics; higher education in commerce or economics (acquisition of the professional higher programme – at least 4 years); 2nd level professional higher education in caritative social work, social work, social pedagogy. Degree awarded: professional master degree in social entrepreneurship management.